Erica (Keller) is a reporter trying to get to the truth about an American selling secret aerospace/military aircraft schematics to Japanese rivals. For help, she goes to private investigator Jack Blaylock (Griffith), a man who speaks fluent Japanese, has an array of SpyTech-type devices, and knows martial arts. What are the true motivations of Malcolm Carter (Howard)? We won’t say what politician he looks like, but let’s just say he “shot someone in the face”. When it turns out the Yakuza is involved, all hell breaks loose in the form of restrained fight sequences and plot twists and turns. Will Erica and Jack find the truth? The tagline on the British VHS goes as follows: “You’ve Seen Seagal and Van Damme. Now...Meet the New Contender”. And, yes, in the heat of the early-to-mid 90’s action boom, various “new contenders” were trotted out: Jeff Speakman, Richard Norton, Gary Daniels, and now Thomas Ian Griffith. Some from that list are more successful than others. But the problem with Griffith, besides his odd hair, is that he has no personality (outside of his winning smile, of course). With such stiff competition back in the day, it must have proved impossible for Griffith to compete with the action names of the time with no hooks of his own. Nothing sets him apart. It seems Ulterior Motives is an attempt to tone down the action elements and highlight the drama/thriller/romance/espionage themes. Reasonable people can argue whether this was successful, but usually muting the violence, action and stunts is NOT a good idea for the fans. The movie has an odd, snoozy pace, and the characters could have used a bit more depth. The length and pacing issues should have been remedied by some snappy editing and better music. Or ANY music. Strangely, there is a lack of music in most scenes, and the music there is happens to be subtle and incidental. Some more driving themes would have, and should have been there to quicken the pace. And there’s another problem. There is no big, main, evil baddie. Yes, there is an antagonist, but he’s a “secret”, so there’s no real tension regarding the hero, Blaylock, wanting to kill him. 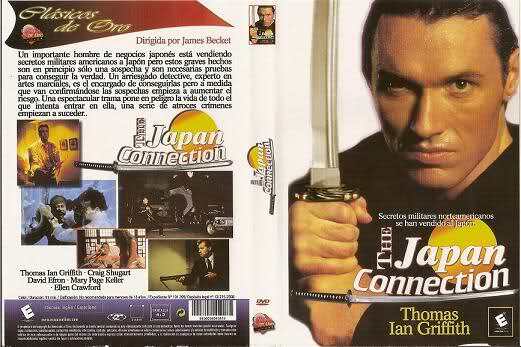 As we saw in China O’Brien (1990), lack of a sinister bad guy is hugely detrimental to the action movie formula. We appreciate the attempt to be “different”, but it’s pointless to be different for different’s sake, especially if the outcome doesn’t deliver the goods. Ulterior Motives should have been a Showdown In Little Tokyo (1991), but instead it’s a Liberty and Bash (1989). We’re sorry if that analogy made no sense. Just see Showdown in Little Tokyo. 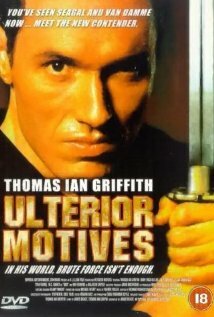 Ulterior Motives (a very telling title, really) needed more action and less jibber-jabber. For a much more satisfying T.I.G. (as we call him) vehicle, check out Excessive Force (1993). Yeah, I tried to get into him as an action star but nothing grabbed me at all. 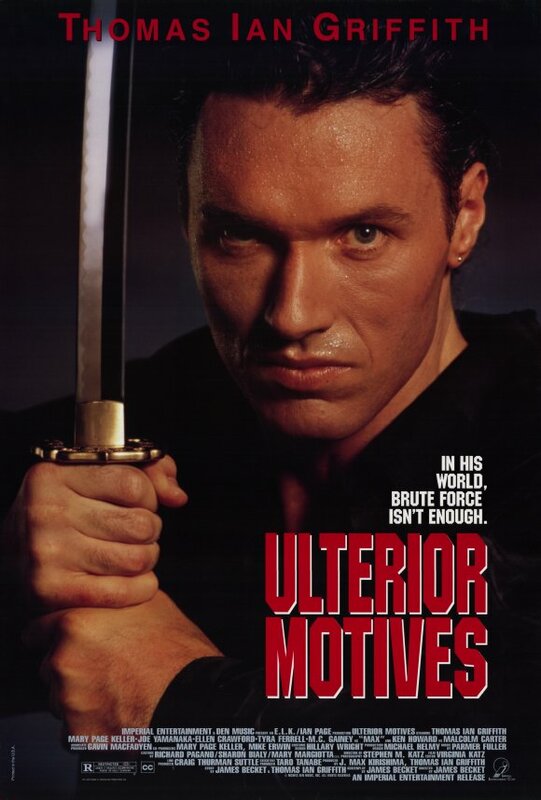 Ulterior motives has to be one of the worst names for an action film ever! Looks like a cross between Highlander and American Ninja 4. A Hero Never Dies: Totally agree with you, Ulterior Motives is a horrible name for an action flick. Also Griffith's best film is Excessive Force. Copyboy: It is heavy on the American Ninja 4 more than Highlander! If only it was a ripoff of Highlander, then it might have been a better movie. A lack of a great baddie is always an issue, definitely. I vaguely remembered this one, but I vaguely remembered being lured in by the "next Van Damme/Seagal, etc." on the VHS cover, and being disappointed, so what you say squares with that. Good review. Thanks DTVC! Happy we both agree that Ulterior Motives was a disappointment. It could have been so much better if TIG actually used a samurai sword (touted on the cover to lure us in...) to kill baddies in the movie.